Organizing your home office is easier than it might seem. It gets really overwhelming to see stacks of papers here and there, receipts stuffed in a drawer, books stacked up “neatly” in the corner – waiting to be read. One step at a time is how we will get it done! Not only will these types of systems save you space, they’ll save you time – and they’ll save your sanity. Think about how crazy you get when you’re searching for that one paper for ten minutes. Eliminate that type of thing by being prepared. 1. I like to start with a clean slate. Clean your desk off completely, and out from under it, around it, etc. 2. Then, start some piles based on how often you use everything. If you use it daily, obviously it can stay on your desk. Weekly? Perhaps there is a drawer that is better suited to be its home. Less than once a month? Donate it, or move it to the attic! Tip: If you’re a “piler”, use PileSmart binder clips to keep papers together by category, without wondering what’s what. They have erasable labels! 3. Create stations – one for mail in and out, one for important papers, and one for “today’s projects”. Handle papers once, and only once. If it’s trash, throw it away as soon as you get it. If it’s supposed to be filed, file it right away. 4. Establish a workflow. When a project comes in, it’ll land in your inbox. But instead of continually shuffling through it (remember our “only touch it once rule”? ), figure out what the next step is. Whether it moves to the next bin, gets filed, or needs to be scanned, make sure it’s easy to access that second step. If papers regularly come in that need to be scanned, your scanner should be next to your inbox. 5. Get rid of magazines. Or craft with them during your downtime. Better yet, read them on your smarphone or tablet with a Next Issue Canada subscription. 6. A place for everything and everything in its place. Create a pen/pencil holder out of a mason jar. If they don’t all fit, unless you’re some type of artist that uses each of them on a regular basis, get rid of the extras. 7. Start a filing system. Whether you file by week, month, year, number, or colour, figure out what works for your home office and stick with it. If you don’t have a filing cabinet yet, now’s the time to get one! Don’t pay full price – check your local buy/sell/trade groups on Facebook before shopping in store. 8. Use the heck out of your label maker, sticky notes, and sticky tabs. 9. Don’t forget to organize your books! Whether you categorize them by genre, author, or colour, get them up on a shelf and out of your way. You’ll want to be able to access them if necessary, but you don’t need stacks of books cluttering your work space. 10. Use your wall space! 11. Purge pens that no longer work, flimsy paper clips, magazines, outdated equipment, and even outdated documents. Be sure to keep tax documents, but other than that, items like pay stubs, medical bills, and bank statements can be shredded every 12 months. 12. If you have a desk lamp that is taking up space, consider swapping it out for a floor lamp. It’ll still give you the light you need for your work space, without taking up needed desk space. 13. Have personal items relocated to your home office? While it’s easy to mix work and personal life when you’re working from home, it’s important to have a set work space. If there are toys in the office that don’t belong, move them back to the kids room. Husband left a few piles of “I’m not sure what these are” papers? Go through them. Trash the ones you don’t need, give the rest back that don’t belong in your office. 14. Organize your email by using an A in front of the label name of the folders you use the most, and a Z in front of the ones you use the least. 15. Still have some tiny things you can’t seem to find a place for? Hang a magnet strip on the wall to house paper clips, or use an ice cube tray to hold things like push pins and thumb tacks. You can also use a utensil tray to organize everything from sticky notes to mini staplers. They’re way cheaper than buying actual desk organizers, too! 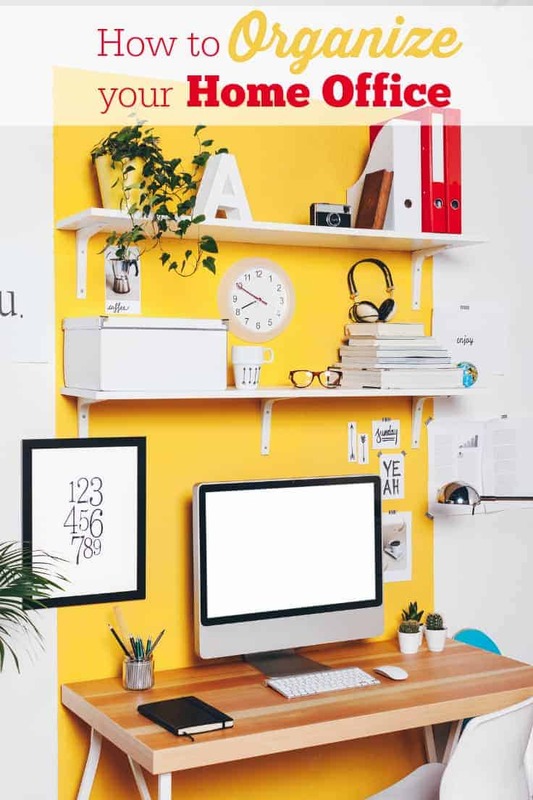 Put some (or all) of these tips into practice and get your home office organized in no time! Is your home office organized the way you want it to be? For the most part, my home office is organized the way I want it to be. Unfortunately, it can get chaotic as it is also a craft space and play spot for my granddaughter. You make good points with the work flows and using wall space. Also little organizers are great whether in a drawer, on the wall, or a cabinet storage and organization accessories are always nice. Great about getting rid of pens. We all have tons, and you don’t they don’t all work. I am so unorganized I think I will need more than this but thanks, its a start. Thanks for the tips! I need to reorganize my desk and could use some of these ideas. This post definitely makes me want to get organized. My desk is a complete mess. I feel like every time I get organized, it’s back to being a mess 2 days later, lol. All great tips! Putting up a couple of shelves and hooks would definitely help me. Thanks for the tips on organizing my office…I started out well but it sure can get out of hand easily if you don’t follow the system daily.